An assumption: bad things happen to bad people; good things happen to good people. If a piano falls on your head, you probably did something to deserve it. If you win the lottery, you must have been some sort of angel or amazingly kind. Reward and punishment. Judgment eclipses mercy. Simple cause and effect with a sprinkling of God. We try to believe this–probably because we want to the world to work like that. And then it doesn’t. There are shootings and they never seem to stop. People [even children] suffer. There is famine. People of all ages don’t have something to eat, even though the world is full of food. One family has kids who grow up in a neighborhood that is safe and attend good schools. Another family has kids who grow up fearing for their lives and their schools are a joke. Neither of those families did anything to deserve either neighborhood. Some stand with signs and flags on the Texas/Mexico border protesting against immigrants entering the United States, yelling slurs and awful things at Native Americans or anyone who even looks brown or speaks Spanish. The Native Americans and others who speak Spanish have lived on those Texas lands for generations, long before those protestors ever stepped foot on that soil. Yet no one yells slurs and awful things at the protestors. No one makes signs and waves flags in their faces if they even look white or speak English. A family lives in Tel Aviv, Israel and another family grows up in the Gaza Strip. Both families practice their faith respectfully and simply live their lives peacefully. One day, a car bomb goes off in the market in Tel Aviv and the dad of the family doesn’t survive. In Palestine, a bomb from Israel hits a supposed Hamas target but also hits the school where the two boys attend. And meanwhile…the CEO of the company that lied to its investors [most of them paycheck-to-paycheck folks] is making millions of dollars [still] and won’t go to jail after all. Meanwhile, the woman who is working 3 jobs in order to take care of her 2 kids after her husband got laid off due to injuring his wrist gets sick but cannot go to the doctor because none of her jobs offer health insurance. Meanwhile, two companies merge to make a mega company, cut a bunch of jobs, and four people out of 20,000 employees split a bunch of money and cash out. Meanwhile, a young woman has ovarian cancer and is undergoing chemotherapy. She’s twenty-four. The cancer spreads; she doesn’t make it. The assumptions don’t make sense anymore. There is bad and it’s happening to good people. There is randomness. Life is unfair. So we ask questions now. Why do bad things happen to good people? Why are there many injustices in the world? And where is God in all this? These questions appear in a well-known book written by Harold Kushner, a conservative Rabbi. 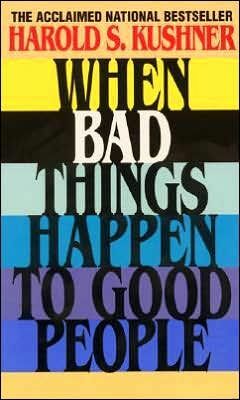 The book, published in 1978, is entitled: When Bad Things Happen to Good People. Okay, Rabbi, but does God care? So God does care and even is as outraged as we are, but then what is the point of all this injustice and suffering? Is it all just random cause-and-effect? Now that this has happened to me, what am I going to do about it? It’s a shift in questioning—not relying on the assumption that God punishes and blesses people for being “good” and “bad.” It’s a shift from “Why God, why?” to “What now will I do?” And this is the story Luke’s Gospel tells us. Jesus of Nazareth encounters sad, angry people who have experienced senseless tragedy. They want answers. They want to know why God would allow such a thing. Galileans were slaughtered by Pilate—their religion and culture desecrated. But instead of giving them a cookie cutter, theological answer, Jesus mentions a falling tower that took 18 lives. Were those people deserving of death? Jesus says repent [literally, turn around]; he shifts their questioning from God’s justice to God’s mercy. It’s not: why do bad things happen to good people? Instead, it’s a parable—a story. A farmer and a vineyard and a fig tree. The farmer is getting impatient, or so it seems. This tree that he planted is just not bearing fruit. So he says to the gardener who is tending the soil: This darn tree, for three years, doesn’t give me any fruit. Cut it down. Get rid of it. Why waste the soil? The gardener replies: Leave it alone for another year. I’ll dig around it, put fertilizer on it. If it bears figs next year, great! But if not, then we will cut it down. The people hungry for answers to the most difficult questions freeze in their tracks. Their questions of why did God allow this to happen? and why do bad things happen to good people? are not the right questions to be asking. It’s time to stop blaming. It’s time to start bearing fruit. Yes, you know where this going and it won’t be a tidy answer to your questions. 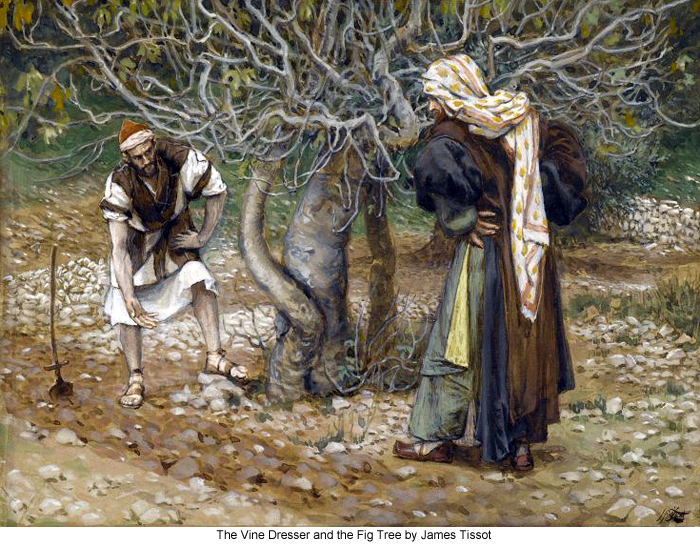 We are the fig trees. We are planted in the ground, cultivated, watered, offered sunlight, cared for, and deeply rooted. We are the trees and we are planted to bear fruit. But life is harsh and winters take their toll. Our fruit spoils and sometimes is attacked by disease. Some seasons, we get flooded. Other years, we get a drought and dry up. Strong winds damage our branches and then overdevelopment tugs, pulls, and even breaks some of our roots. Eventually, we don’t bear any fruit. Weeks, months, even years can pass. Our branches spread out cold and bear with not even a bud. No fruit. We start to forget a time when we ever did bear fruit. And then, eventually, we start to think that we will never bear any fruit. Cut us down. Tear our roots out of the good soil. Stop watering, stop tending to us. We are worthless. But then the gardener says: there is still time for this tree to turn around. There is still time to cultivate this seemingly fruitless tree. The patient gardener adds some good fertilizer and digs around our roots. The graceful gardener waters us just right and makes sure we feel the pleasant rays of the sun. The merciful gardener cares for our branches and fends off the developers who want to cut us down. And then the seemingly fruitless tree of ours has a chance. Winter won’t last forever and spring is coming. We start to bud. Figs appear. They ripen. They are sweet, delicious, and life-giving to the animals and creatures all around us. And the gardener is pleased. Friends, God’s patient grace is not indifference to the suffering in the world. When people suffer or wherever there is injustice, God is bothered by it. So are we. And we should be bothered by it. We shouldn’t try to alleviate the pain of that feeling. We shouldn’t try to justify the pain or the injustice. We shouldn’t let our roots dry up or our branches break off, just so we don’t have to think about it. The sad, frustrated, angry feelings about injustice and suffering are real. But the uncomfortable message in the parable is that we still have time to do something. We have time to turn around. We have time to bear fruit in the world. We shouldn’t let fear or depression convince us that our trees are lifeless with no chance of producing fruit. There is still time. So we should bear the fruit of justice and healing. Our anger and frustration over the sufferings and the injustice in the world should motivate us to do good—to bear even more fruit. There are no easy answers, no closure. Jesus knew this; Jesus taught this. But as trees planted in this world, we have to stop blaming God for it. When we blame we do nothing about it. We are trees planted in the ground to bear fruit. And sometimes we will need other trees to help us remember how to bear fruit. Other times we need gardeners who will dig and fertilize and help us have what we need to grow. We need a community of trees. And once we start recognizing this about our identity, something happens. The fruit we bear does indeed touch those living around our tree. Then other trees start to bear fruit around us. Before we know it, there is a forest of trees bearing fruit. There is always time for mercy. Kushner, Harold, When Bad Things Happen to Good People. Random House Inc., 1978.